cardiac wall necrosis or sepsis (2-4). A wide range of retrievers has been developed to meet the needs for different case scenarios. Those retrievers are loop snare catheters, hook tip guidewires or catheters, basket retrievers, and grasping forceps or catheters (5,6). We report a case of a 41 years old male patient transferred to our clinic for a foreign body in the left brachiocephalic vein. The patient past history includes stage V chronic kidney disease on haemodialysis, cirrhosis due to hepatitis C virus infection complicated with splenomegaly and pancytopenia. Three days ago, a central venous catheter was inserted through the subclavian vein for haemodialysis. During the insertion of the catheter the guidewire passed from the right brachiocephalic vein into the left brachiocephalic vein. When the dilator was introduced, it has fractured the guidewire which remained trapped into the left brachiocephalic vein. On admission, the patient was asymptomatic, clinical examination revealed mild hepatomegaly and splenomegaly and the central venous catheter was fully functional. Blood tests showed increased creatinine (8 mg/dl), moderate anaemia (haemoglobin = 8,2 mg/dl), leukopenia (white blood cells = 2.29*103/μL) and moderate to severe thrombocytopenia (platelets = 51*103/μL). The electrocardiogram was normal. Transthoracic echocardiography showed normal left and right ventricle systolic function, type I left ventricle diastolic dysfunction, mild mitral and tricuspid regurgitation, no intracardiac masses and foreign object, no sign of pulmonary hypertension. 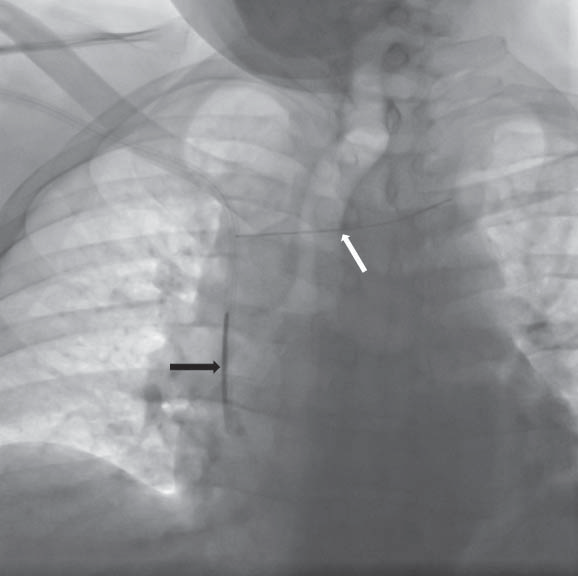 The chest X ray showed the central venous catheter that passes from the right subclavian vein to the superior vena cava with a short radioopaque, linear foreign body in the distal venous lumen (represent a part of the central core of the fractured guidewire) and a linear, radio-opaque foreign body in the left brachiocephalic vein (represent the surface coil dislodged from the central core of the fractures quidewire) Figure 1). To better understand the exact situation, it is important to know the structure of a guidewire. All guidewires has a central part named central core which is a straight bare metal that is tapered by a surface coil. In this case, the central core of the fractured guidewire remained in the central venous catheter and the surface coil dislodged from the central core of the guidewire remained in the left brachiocephalic vein. For the retrieval of the foreign object a 6 french right femoral vein sheath was introduced and we used an Amplatz GooseNeck® Snare Kit (eV3) (Figure 2). The snare was advanced from the inferior vena cava through right atrium and superior vena cava to the left brachiocephalic vein. The distal part of the foreign body was caught with the snare in the left brachiocephalic vein (Figure 3). We tried to pull the foreign body but it remained fixed in the left brachiocephalic vein by its distal part and it elongated by uncoiling (Figure 4). After the coil was withdrawn in the inferior vena cava, the patient became symptomatic and a high resistance to withdrawal was felt, so we reconsidered the approach. The foreign body was entrapped into the snare sheath and a left brachiocephalic venography was performed showing the extravascular course of the proximal part of the foreign body (Figure 5). After several attempts the foreign body was dislocated from the left brachiocephalic vein, trapped into the snare sheath and removed (Figure 6). Aft er the procedure the patient was asymptomatic and he was discharged the next day. Figure 1. 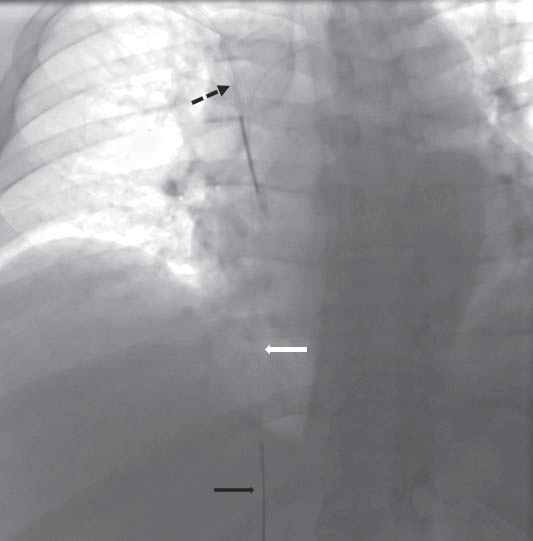 Chest X ray: central venous catheter that passes from the right subclavian vein to the superior vena cava with a short radio-opaque, linear foreign body in the distal venous lumen (represent a part of the central core of the fractured guidewire) – white arrow, and a linear, radio-opaque foreign body in the left brachiocephalic vein (represent the surface coil dislodged from the central core of the fractures quidewire) – black arrow. Figure 2. Amplatz GooseNeck® Snare (eV3). Figure 3. The distal part of the foreign body (white arrow) was caught with the snare (black arrow) in the left brachiocephalic vein. The dashed arrow points the central venous catheter. Figure 4. The caught foreign body with the snare (black arrow) was withdrawn but it remained fixed in the left brachiocephalic vein by its distal part and it elongated by unwinding (white arrow); the dashed arrow points the central venous catheter. Figure 5. 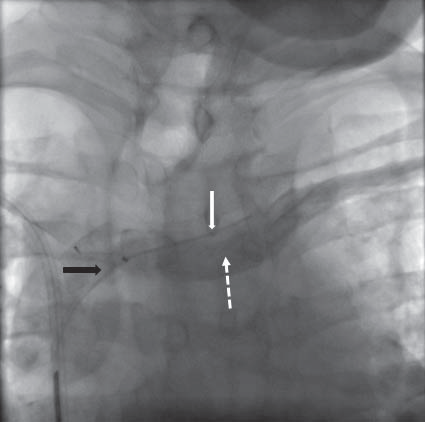 Entrapment of the foreign body into the snare sheath (black arrow); left brachiocephalic venography (dashed arrow) that showed the extravascular course of the proximal part of the foreign body (white arrow). Figure 6. The retrived foreign body; snare – black arrow; uncoiled part of the foreign body – white arrow; coiled part of the foreign body – dashed arrow. The most frequent embolized foreign bodies are guidewires and parts from a venous catether. Those foreign bodies can be removed using dedicated retrievers or a homemade snare in case the formers are not available. To build a homemade snare requires equipment that is available in most cath labs. It consists in a slightly curved diagnostic catheter, like Judkins Right, and a 0,014” or 0,018” guidewire that it’s looped and introduced into the diagnostic catheter. Th e Goose-Neck Snare that we have used in this care is very useful, safe, and versatile for the extraction of different types of foreign bodies in different territories (6). There is any consensus about the technique to be used in the percutaneous extraction of foreign bodies. The used technique differs from a clinical scenarios to the another, and the approach can be changed during the procedure how we have shown with this case. Disclosures: The authors declare that there is no conflict of interest. 1. Choksy P, Zaidi SS, Kapoor D. Removal of intracardiac fractured port-A catheter utilizing an existing forearm peripheral intravenous access site in the cath lab. Th e Journal of invasive cardiology 2014;26:75-6. 2. Pathak CK YM. 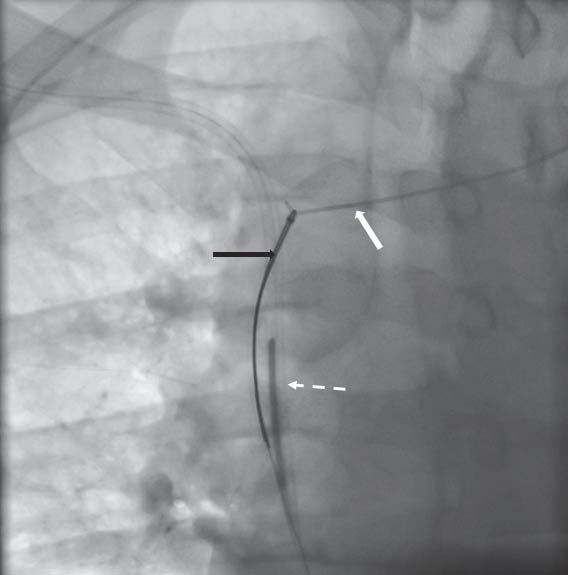 Percutaneous removal of intracardiac and intravascular foreign bodies, MJAFI 2011;67:367–369. 3. Actis Dato GM, Arslanian A, Di Marzio P, Filosso PL, Ruffi ni E. Posttraumatic and iatrogenic foreign bodies in the heart: report of fourteen cases and review of the literature. The Journal of thoracic and cardiovascular surgery 2003;126:408-14. 4. Gschwind CR. Th e intravenous foreign body: a report of 2 cases. The Journal of hand surgery 2002;27:350-4. 5. Mainar V, Pico Aracil F, Bordes P, Ruiz Ros JA, Campos Peris JV, Marin F. [Percutaneous extraction of intravascular foreign bodies: a series of 38 cases]. Rev Esp Cardiol 1996;49:41-7. 6. Zurera LJ CM, Espejo JJ et al. 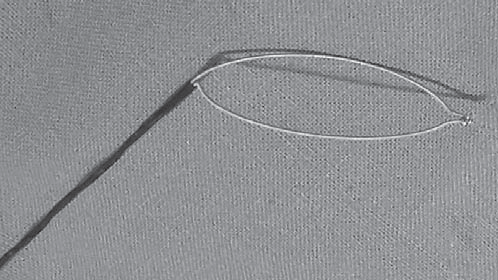 Practical aspects in the percutaneous extraction of foreign bodies using a Goose-Neck Snare. Radiologia 2007 Jul-Aug;49(4):247-54.